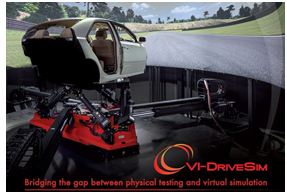 VI-DriveSim is a revolutionary turnkey solution from VI-grade which provides automotive engineers with a complete set of innovative, integra ted driving simulators for a new generation approach to system-level simulation, allowing companies to bridge the gap between virtual prototyping and testing. VI-DriveSim provides the ability of “feeling” the results of your simulations in a totally immersive environment starting from early phases of the development process. VI-DriveSim is available in two different configurations: static and dynamic. 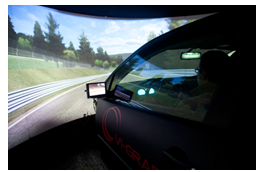 In the static configuration, users have the possibility to drive a virtual vehicle model based on VI-CarRealTime, visualizing vehicle behavior on a wide screen with unprecedented high quality graphics while sitting on a fixed cockpit, that does not move according to car maneuvers. The dynamic configuration provides motion feedback to the driver thanks to an innovative nine-degrees-of-freedom moving platform with reduced overall dimensions and large travels. The new machine architecture is called Driver in Motion (DiM) and its kinematics has been designed, for the first time in history of motion platforms, for implementing in the best possible way the motion cueing technology that has been developed and tested by VI-grade since the year 2008. VI-DriveSim is based on a much more compact and much less expensive driving simulator architecture with respect to conventional simulators with similar workspace. Moreover, VI-DriveSim is fully scalable, meaning that it is possible to upgrade from static to dynamic simulator recycling virtually all components that have been already purchased. Vehicle development for best handling & comfort is becoming more and more complex and involves different disciplines. This is why automakers are introducing a new hybrid step in the complex assessment process between virtual prototyping and vehicle on-road testing. One fundamental component of this concept is provided by introducing the human in the development loop at an earlier stage.